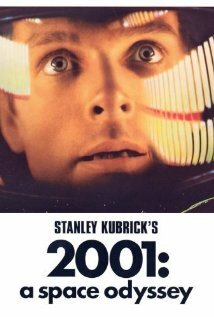 I first saw 2001: A Space Odyssey in 1968. It was a landmark movie for me. Until then, I viewed movies primarily as entertainments that occasionally had a worthwhile message. 2001 was an intellectual, mind-expanding experience. I left the theatre fascinated and wondering what it was all about. The controversy over the film mushroomed over the years. Originally opening to mixed reviews, it became a cult favorite and thousands of people have written about it. I have my own view of the meaning of the film, which I will share with you; but in no way is my understanding of the film definitive. It just represents my thinking after viewing the film three times over the course of close to fifty years. The movie is divided into three parts. Part One entitled “The Dawn of Man” depicts a serene African landscape populated mostly by apes who argue over rights to a waterhole. In the midst of their contention, a black rectangular monolith mysteriously emerges from the ground, and the apes view it with wonder. The next day one ape learns how to use a bone of a dead animal as a weapon, and he uses it to claim control over the waterhole. The sequence ends with the ape throwing the bone into the air and the bone morphing into a spaceship, which introduces the viewer to the second part of the film. In this second part, we are introduced to Dr. Heywood Floyd, a scientist bound for Clavius, an outpost on the moon. Ostensibly traveling there to determine if there is an epidemic on the outpost, there is a veil of secrecy over the mission, suggesting another purpose for Dr. Floyd’s trip. Once on Clavius, Floyd and his team discover the same rectangular monolith that appeared before the apes in the previous sequence. The monolith seems to have emerged from the ground and been in existence for millions of years. The third part of the film takes place eighteen months later as an American spaceship journeys to the planet Jupiter. Commanding the ship are mission pilots and scientists Drs. David Bowman and Frank Poole. Traveling with them are three other scientists in cryogenic hibernation, and the ship’s computer Hal 9000, who controls most of the ship’s operations. As they fly towards their destination, they discover that Hal is making errors and they struggle to determine the source of these apparent malfunctions. They conclude that Hal is sabotaging the voyage and they attempt to deactivate him, which leads to a series of dire complications. In the process of disconnecting Hal, Bowman learns about the real purpose of the mission: to discover the origin and purpose of the monolith on the moon. Bowman’s ship is then brought into a vortex of colored lights and designs, suggesting his transportation to an unknown location. When he arrives there, we find him in a tastefully furnished apartment in which he sees himself as an older man, and then as a dying man. As a man about to expire with his last breath, he sees the monolith at the end of his bed. He is then transformed to an embryo floating through space, which is the closing image of the film. My summary of 2001 reflects the intellectual ambiguities embedded in the narrative. It is evident that the unexplained existence of the monolith is the image that unites the three sections of the film. In simple terms, the film glorifies science and technology, which enable the apes to become intelligent men and to harness technology in the service of man. The monolith, however, suggests the limitations of science. There are simply some things that cannot be known or understood. I do not think that 2001 has a religious agenda. However, hidden within the history of man from his origins as a half-man, half-ape, to a scientist probing the outer limits of the universe is the notion that man can never know the secrets of creation. The singular response to this cosmic mystery is to view the world with a sense of wonder. The closing image of the fetus in a sac observing the universe simultaneously reminds us of our limitations as human beings and of our ability to see the world anew each and every day just as a small child would view this amazing universe. Posted in Drama, Movie review, Science Fiction. Bookmark the permalink. Great post. A movie that leaves the viewer pondering questions far past the end credits.